Oh sweet propaganda. I love the qualification of "it's fine in moderation." Yeah, so is cyanide. Problem is, high-fructose corn syrup (HFCS) is in a lot of foods which you wouldn't expect. It's not just sugary drinks and ice pops. HFCS is in most commercially available bread, even "whole wheat" and "multi-grain" varieties. It's in that all-American condiment, ketchup. "The environmental footprint of HFCS is deep and wide," writes [Michael] Pollan, a prominent critic of industrial agriculture. "Look no farther than the dead zone in the Gulf [of Mexico], an area the size of New Jersey where virtually nothing will live because it has been starved of oxygen by the fertilizer runoff coming down the Mississippi from the Corn Belt. Then there is the atrazine in the water in farm country -- a nasty herbicide that, at concentrations as little as 0.1 part per billion, has been shown to turn male frogs into hermaphrodites." Milling and chemically altering corn to form high-fructose corn syrup also is energy-intensive. That's not to say that corn is evil and other foods aren't; all crops require energy to grow and transport. What makes corn a target is that federal subsidies -- and tariffs on imported sugar -- keep prices low, paving the way for widespread use of high-fructose corn syrup and, in the process, keeping the American palate accustomed to the sweetness it provides. Oh, and it's not surprising, the commercial was brought to you by the Corn Refiners Association. Forests aren't just the stuff of fairy tales, but they are heading that way. 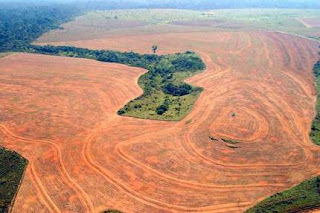 Deforestation continues at a rate of 32 million acres per year. But you can help stop it.